Briefs are really, really important. Over the years, as an agency, we’ve seen that it’s been those campaigns that have had client briefs that have been the most successful. Of course, agencies generally are pretty good at getting you results, but, without the guidance of the holy client brief, there is no guarantee that these results will be the ones that you want. And you didn’t commission your agency to do the wrong work. If you want the best from your campaigns, you need to be thinking briefs. But it’s the brief that’s most important, possessing an almost divine-like power over the success of your campaigns. It is a set of mutually understood co-ordinates that your agency can use to lead you to success. Inarguably, it is the most important piece of information belonging to each of your campaigns, as it is the foundation on which everything is built. If a brief is confusing or incomplete, or worse non-existent, it can have dire impact on the success of your campaign. Another way of thinking about it – ‘the better the brief, the better and more on target the results’. What should you consider when you are writing a brief? What else is going on in the market? Answers to these questions will interrogate your thinking, clarify your understanding and help you better communicate with your agency. And in turn, this will enable them to better know where you are and where you want to be. What are the benefits of having a brief? A common misconception is that jumping on the phone with your agency or sending them a quick email is a much faster way of getting things moving at the start of a project. And sure, for smaller projects, and if your agency is familiar with your brand, this can be a good solution. But for the most part, this type of quick-fix actually loses you substantial time as key parts of the brief are often left out or not thought through. The fact is, there’s a lot that your agency needs to know up front, and the clearer you can make it for them in the beginning, the more enabled they will be to deliver on what you want more accurately. A brief serves to minimise the questions, confusion and lack of understanding that can seriously waste a lot of your time. In other words, taking the time to write a brief up front will save you time in the middle and end of the project, and chances are that you’ll get to where you want to be more easily and much faster. And, of course, time is money. If you’re saving time, you’re saving money. To reiterate, a brief is the best way to minimise ‘getting it wrong’. Or, in other words, the best way to avoid those unnecessary rounds of feedback spent trying to get it right. Goes without saying, these can have a significant impact on your budget. Naturally agencies don’t always get it right the first time around, but if they know what you want, and where you want to be, from the start, they’ll be better placed to get you there in less time. And if you get there faster, your projects will be more likely to stay in the green and you won’t need to source additional budget. It will get you results. A brief is the best way to enable your agency to reach their full potential. When a brief is done well, it’s like a match strike that sparks your agency into their own unique creative and strategic momentum – the reason you commissioned them in the first place. This is where great ideas are born and where your agency truly shines. If something in the brief is unclear or missing, it can stifle this momentum and hinder creativity, and this can mean the difference between good ideas and truly amazing ideas. A brief will help you get the results that you want, and beyond. When you order food at a restaurant and the waiter repeats it back to you, it gives you the confidence to know that you’ll more than likely get what you ordered. Similarly, if you are confident that your brief is all-encompassing and correct, you can have the same confidence knowing that your agency has the right information and everything they need to get going. What’s more, during the briefing process, your agency will take your brief and, like a waiter, repeat it back to you, but with recommendations and a creative response. This all works to give you the confidence you should always have when you leave your agency. It will help you measure success. 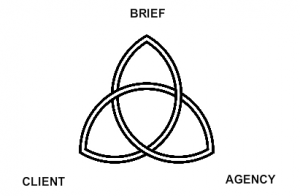 More than anything, a brief is an agreement of objectives and ‘what success looks like’. A criterion to evaluate your campaign. At any stage in the process, you can hold your campaign accountable to this agreement and measure success more accurately. Not to mention, your agency will use it as a measure internally to validate the work that’s being done to ensure that they deliver more closely on what you originally ask for. Briefs are the foundation of your campaign, from this everything will build.